The Dodecanese is actually made up of 32 islands, with over half uninhabited. Most of the islands lie close to the coast of Turkey, and the ancient Ottoman influences can still be seen. Rhodes is the largest of the islands and has long been a popular destination for European tourists. It may be over 2000 years since the Colossus of Rhodes fell, but the island still has many sights to delight travellers. The Old Town is a UNESCO World Heritage Site, and there are archaeological sites all over this island, including the Acropolis of Lindos, several castles, temples and palaces. The town beaches get busy, but it’s still possible to find near-deserted strands where you can swim, sunbathe and surf. Of the smaller islands, Kos also has an airport and is a destination in its own right. Most of the islanders are involved in agriculture; this rich island produces grapes, almonds, figs, olive sand tomatoes. But the main tourist draw is of course, the beaches which are wonderfully long and clean. But one of the main advantages of travelling by yacht is you can visit smaller islands that are off the main tourist routes. Daytrippers may arrive from 10am until 4pm, but otherwise it’s quite possible to have the bay all to yourself. 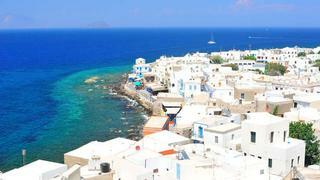 Highlights include Nisyros, said to be the most beautiful Greek Island, with lush vegetation contrasted by volcanic slopes; unspoilt Tilos with sandy beaches, rocky inlets shaded by walnut and almond trees, or tiny Marathi, where the handful of inhabitants will welcome you with fresh seafood and wine to refresh you after swimming in the deserted bay.